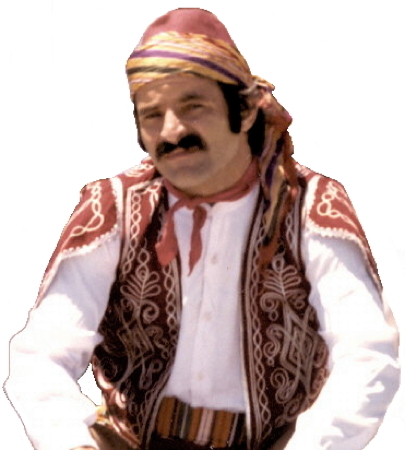 Information: Bora Özkök, musician and teacher of Turkish folk dances. Bora Özkök, whose first name means "strong hurricane wind" in Turkish, was born and grew up on the Mediterranean coast in Adana, Turkey, where his mother was a school teacher and his father a pediatric doctor. His interest in folk dance was rooted in his childhood, when his parents took him to watch, but not participate in, folklore shows. From the age of eleven, Bora attended a private school in İstanbul, where English was the main language. During the eight years he spent there, he was outstanding in his studies and in sports, excelling in swimming, soccer, wrestling, water polo, and ping-pong. At the age of fifteen, Bora was a member of the Turkish Olympic swim team in the Rome Olympics of 1960. Bora represented Turkey in nine different countries as a member of the national team, breaking many records in the backstroke and freestyle events. One accomplishment was winning the 20-mile Turkish Marathon Swim in 1966 in eight hours (he lost 28 pounds during the event!). Upon graduation, Bora continued at a private architectural school for a year. Then, in 1965, he came to the United States on an athletic scholarship granted by the University of California at Berkeley, where his major was in architecture. At Berkeley, he was an All American in soccer in 1967 and won the Most Valuable Player award for that year. In 1969, Bora was selected as one of the twelve outstanding foreign students in America, chosen from 1,000 Middle-Eastern nominees from 500 universities and colleges in the United States, and the outstanding representative of Turkey. He graduated from Berkeley in 1971 with a Bachelors Degree in Architecture. Bora began folk dancing at Berkeley in 1967, and learned his first Turkish dances during a visit to Turkey in 1970 from members of the Turkish National Folk Dance Ensemble. After his return that same year, he taught at the San Francisco Kolo Festeival and the rest, as they say, is history. He was quick to give credit to his friend Tom Bozigian for guidance in folk dance teaching. Bora was not only an outstanding dancer and inspiring teacher, he was a talented musician, playing music for the dances he taught. Adept at using various ethnic musical instruments, he accompanied his teaching by playing the Turkish zurna (woodwind instrument), tulum (bagpipe), kaval (end-blown flute), and davul (large double-headed drum), as well as the saz (or bağlama  plucked string instrument), clarinet, mey (double-reed flute), recorder, harmonica, banjo, and mandolin. In 1975, Bora played the zurna as accompaniment to famed Jamila Salimpour's danse orientale dancers at the San Francisco Renaissance Faire. In 1976, he arranged and accompanied the performing tour of FOTEM (Folk Training and Education Center of İstanbul) across the United States. It is unfortunate that anti-Turkish factions in the United States at the time used these artistic and cultural events as their forum. After returning to Turkey in 1976 to complete his Turkish military obligation and retain his Turkish citizenship, Bora spent years doing research into the dances of his native Turkey with the Turkish State Folk Dance Ensemble, and collecting dances and music in Turkish villages. Since 1979, Bora directed the Turkish Dance Seminar at Lake Abant, Turkey, followed by a tour of Turkey. He was also the director of the Mid-America Folk Dance and Music Conference (M.A.D), which was held annualy in August at the University of Windsor in Canada. Bora taught at most of the major folk dance camps across North America, such as and Holiday Camp, the San Diego State University Folk Dance Conference, Santa Barbara Folk Dance Conference, and Stockton Folk Dance Camp in California, and at many colleges and universities. He taught in Taiwan, Hong Kong, Japan, and Australia. He also was invited to teach a Black Sea suite to the the Pittsburgh-based Duquesne University Tamburitzans. Bora was the director of Cultural Folk Tours, Inc., conducting tours to Turkey which took you to see the Ottoman Military Band in İstanbul, the spiritual Whirling Dervish ceremony in Cappadocia, native folk dancing, a live Romani orchestra, and much more. He has since sold his tourist business and is living comfortably. Bora produced several fine records of Turkish dance music on his BOZ-OK label. Mid-America Folkdance and Music Conference: workshop and syllabus. Özkök, Bora. Annual, 1984-?. Traditional Turkish Designs and Handicrafts, Özkök, Bora (co-author). Boz-Ok 101  Folklore Dances and Music of Turkey: Işte Hende, Delilo, Kendime, Dokuzlu. Boz-Ok 102  Folklore Dances and Music of Turkey: Ali Paşa, Harmandale, Zeybek, Hoş Bilezik, Karşilama. Boz-Ok 103  Folklore Dances and Music of Turkey: Sallama, Berde, Gün Ola, Vesil Bari. Boz-Ok 104  Folklore Dances and Music of Turkey: Keçiko, Çitçit, Hora, Deriko. Boz-Ok 105  Folklore Dances and Music of Turkey: Delilo, Güzeleme, Kara Tiren, Avreş. Boz-Ok 106  Folklore Dances and Music of Turkey: Çepikli, Halay, Çayda Çira. Boz-Ok 107  Folklore Dances and Music of Turkey: Derhule, Kavak, Başbar. Boz-Ok 108  Folklore Dances and Music of Turkey: Ala Geyik, Çapik, Oğuzlu. Boz-Ok 109  Folklore Dances and Music of Turkey: Garzane, Konyali, Harmandali, Zeybek. Boz-Ok 110  Folklore Dances and Music of Turkey: Bengi, Bülbül Oy, Köroğlu. Boz-Ok 111  Folklore Dances and Music of Turkey: Saç Baği, Muğla Zeybeği, Turkish Medley. To-Bo 101  Kavak, Papuri, Oğuzlu, Muş Bari, Lorke Lorke, Çepikli. Son of a military doctor and school teacher. Olympic swimmer and marathon champion for Turkey. 1964  Went to Berkeley on swimming and soccer scholarship. 1971  Began to tour North America. 1979  Began to organize tours of Turkey. 1984  Began [Mid-America Folk Dance and Music Conference]. 1989  Formed "Cultural Folk Tours Int'l, Inc."